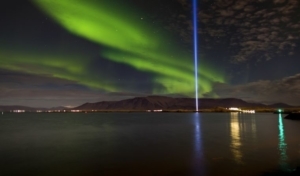 As I said yesterday, I’m planning to make a pilgrimage to the Imagine Peace Tower in Reykjavik later this year. When I go, I will be taking thousands of heartfelt wishes for peace with me to place in the base of the tower. I am collecting these wishes everywhere I go and from the more than 500 people who visit Lovegrove Gallery & Gardens each day during season. If you’d like me to take your heartfelt wishes for peace to Iceland, swing by or contact the gallery. The number is 239-938-5655. So how did I come up with Heartfelt Wishes? 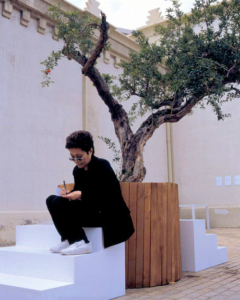 It is a derivative of an interactive artwork conceived by Yoko Ono called Wish Tree. 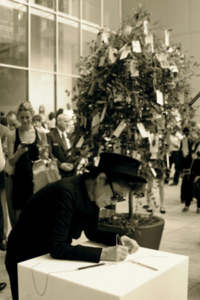 Wish Tree has been a cornerstone in Yoko’s exhibitions since her introduction of the concept sometime in the early ’90s. 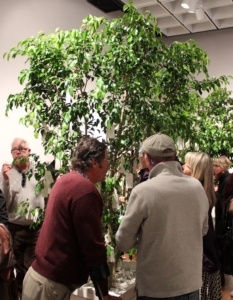 At the Yoko Ono Imagine Peace exhibition at the Bob Rauschenberg Gallery here in Fort Myers a couple of years ago, co-curators Kevin Concannon and John Noga together with Director Jade Dellinger installed two ficus trees inside the Bob Rauschenberg Gallery to serve as receptacles for wishes scribbled by visitors on shipping tags that had been provided for that purpose. 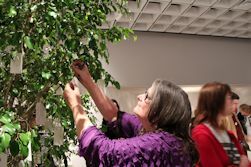 Virtually every one of the 896 people who attended the show’s opening reception took the time to attach their written wish to a branch. 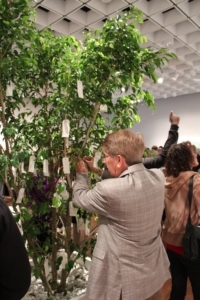 As Yoko intended, most were visibly affected, not only by the exercise of formulating and writing out their personal wish for peace, but by the collective effort codified by the growing bloom of tags covering each tree. 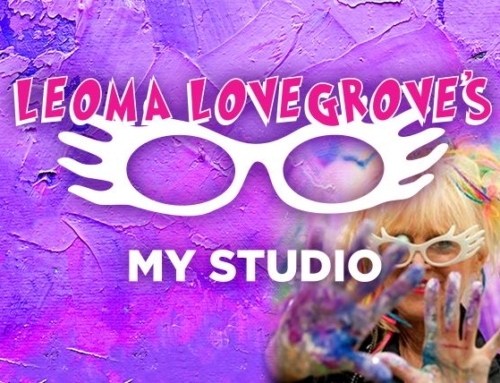 Yoko herself likens this to a collective prayer. “As a child in Japan, I used to go to a temple and write out a wish on a piece of thin paper and tie it around the branch of a tree. 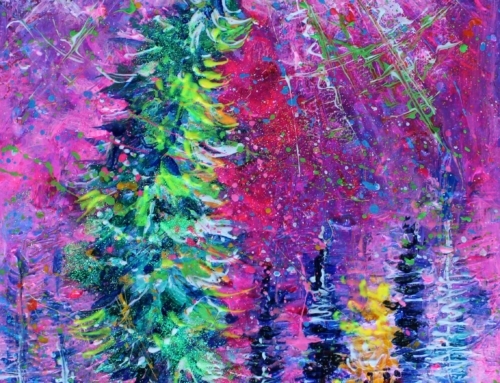 Trees in temple courtyards were always filled with people’s wish knots, which looked like white flowers blossoming from afar,” she has explained in interviews. Many cultures have wishing trees, where believers make votive offerings in order to gain fulfillment of their wish. For example, there is a hawthorn tree in Argyll, Scotland where hundreds of coins have been hammered into the trunk and branches in hopes that wishes for fertility will be granted by the spirits or faeries associated with the tree. The practice of tying pieces of cloth to a wish tree is often directly associated with nearby clootie wells, as they are known in Scotland and Ireland. Locals and visitors in Hong Kong write wishes on joss paper, tie them to oranges and toss them into two banyan trees known as the Lam Tsuen Wishing Trees. Legend states that if the paper sticks to one of the branches, that wish will come true. In the Loch Lomond and the Trossachs National Park Centre Scotland, people tie their wishes for the environment to wish trees located there. In a related cultural tradition found in many places, including the United States, supplicants hurl shoes into trees that are locally designated as wellsprings of good fortune. 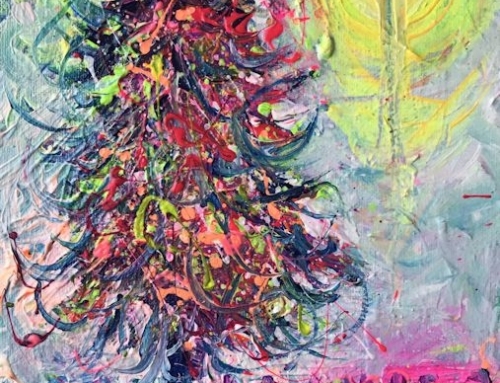 Not all of Ono’s Wish Trees have been associated with larger exhibitions of her work. For example, a Wish Tree has been installed in the sculpture garden at New York’s Museum of Modern Art, with another being placed in the Hirshhorn Museum and Sculpture Garden in Washington D.C. But no matter where or why the Wish Tree appears, the wishes attached to their branches are destined for interment inside the base of the Imagine Peace Tower on Videy Island in Kollafjörður Bay near Reykjavík, Iceland. 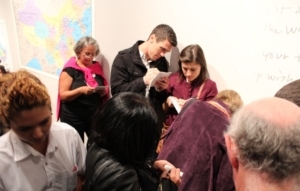 Nowadays, she encourages curators and exhibitors to send their wishes directly to the Tower. 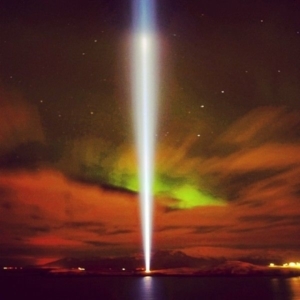 In fact, the website she’s created for the tower provides both an email address (wish@imaginepeace.com) and post office box (IMAGINE PEACE TOWER, P.O.Box 1009, 121 Reykjavik, Iceland) for this very purpose. 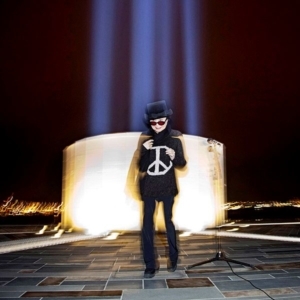 To date, the wishing-well base of the Imagine Peace Tower holds more than a million wishes from people across the globe – including the ones collected during Yoko Ono Imagine Peace exhibition in Fort Myers. But with Kim Jong Un in North Korea, ISIS and madmen like the guy in Las Vegas, there is more of a need for Heartfelt Wishes for Peace today than ever before. And as I discovered during my Remember 9-11 Tenth Anniversary initiative, many people find it difficult, if not impossible to come to a brick-and- mortar location even for a cause as worthwhile as this. So, I take hand-painted paper hearts with me everywhere I go so that the people I encounter can have the opportunity to express their heartfelt wishes for peace, reflect on what they can do in their lives to bring those wishes to fruition, and know that their unique wishes will join the million others that reside today in the base of the Imagine Peace Tower! It’s an ambitious undertaking. I know. I know. 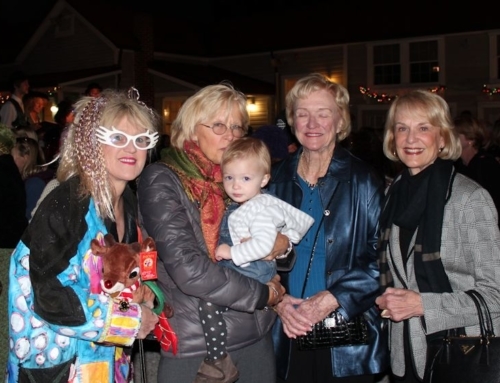 But as John once sang, we have to “give peace a chance!” That’s why I’ve become a Heartfelt Wishes Peace Ambassador.